The Music, Worship & Performing Arts Department (MWPA) seeks to develop highly skilled artists to influence culture with grace and truth. Music Performance: Equipping musical artists to minister as “salt and light” in the world of the performing arts. Musical Theater: Helping students to excel in their art form while developing the academic, technical and spiritual tools needed to serve missionally in and through a professional musical theatre career. Worship Arts: Equipping and mentoring worship leaders for restorative, missional ministry in and through the local church. To read more about the Music, Worship & Performing Arts department’s objectives and its effectiveness explore the quick links below. Beyond our majors MWPA offers all traditional undergraduate students the opportunity to get involved with our various ensembles. Chamber Singers. This acapella ensemble is made up of 14-16 vocalists who are also members of the LBC Chorale. Audition is required. Chapel Guild Choir. This 40-60 member contemporary gospel choir. Performances on and off campus. Audition required. Chorale. A university-level choir with 60+ vocalists. Performances on and off campus. Audition is required. Worship Teams (Vocals). A rotating group of student-led teams incorporating band, vocals, and various other string and wind instruments. Audition is required. Handbell Choir. No experience required. Audition is required. Instrumental Chamber. Small group of student instrumentalists that change each semester, based on interest and coached by faculty members. Past ensembles include a woodwind trio, guitar ensemble, string trio, and many others. Audition is required. Orchestra. Performs as a support to LBC productions and is supplemented by professionals. Audition is required. Percussion Ensemble. Small group of student percussionists. Performs on and off campus. Audition is required. Wind Ensemble. Wind and percussion players performing. standard wind band literature. Audition is required. Worship Teams (Instrumental). A rotating group of student-led teams incorporating band, vocals, and various other string and wind instruments. Placement by audition. Audition is required. Fall Play. Past productions include Godspell, Smoke On the Mountain, and Pride & Prejudice. Auditions for the fall play are held in the spring and rehearsals are held during the fall semester. Musical Theatre Workshop. This ensemble gives vocal and musical theatre performers an opportunity to study musical theatre roles in an ensemble setting with the goal of maturing vocal performance, while also gaining knowledge in the history and literature of musical theatre. Opera Workshop. The opera workshop is an ensemble for moderate to advanced classical singers to explore the musical, linguistic, and dramatic preparation and performance of scenes from the operatic repertory. Winter Musical Production. Students from any program are invited to audition for the Winter Musical. Auditions are required and held in the fall. Rehearsals and performances occur in January of each year. Live Production Teams. More a behind-the-scenes person? These team supports our musical groups and theatre productions in audio, lighting, graphics, set design and live video. 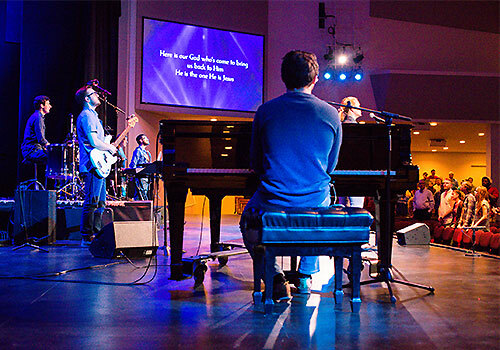 Teams are need for chapel, worship teams, and theatre productions. There are various options for private lessons as well. Feel free to send us a message or question using the form here. This message will be send directly to the Music, Worship and Performing Arts Department here at Lancaster Bible College.